Up for sale is a Fifth Avenue Crystal, Portico Pattern Console Bowl. The 24% Lead Crystal Bowl is 9" wide at the top and 6 1/2" tall. A Vintage Leonard of Italy Large Crystal and Silver Plate Salad Bowl or Fruit Bowl. It is 9" across, and 4" high. Does show its age, but still in very good condition, and free from any chips, breaks, or fleabites. Shipped with USPS Priority Mail. I am a dedicated picker! Crafted in Italy. 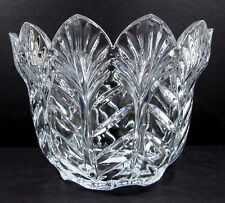 Lead Crystal Fruit Salad Bowl w/ Saw Tooth Rim Wheat Design Gift. Everyday Crystal Bowl Fruit Salad Circles 9" Round NEW! Bowl has circles as a design on the outside of the bowl (3D). Base of bowl is 4 1/2" round. Top of the bowl is 9" round and is scalloped. Inside of bowl is smooth. Made in Israel by Phoenicia. Dessert & Salad Set. Four (4) 4 1/2" Desert / Salad Bowls. Like New in Original slightly shelf worn Box. Be sure to add us to your favorites list ! One (1) 81/2" Serving Bowl. If problem should ever arise I will do my very best to make sure you are satisfied. This beautiful bowl was made by either the Violetta or Irena Crystal glass factory in Poland. It is made from 24% lead crystal and is hand cut. It is in like-new condition. Crystal Bowl. Vintage Czech Bohemian Cut Crystal Serving Salad Bowl LISMORE Pattern 10"
Lismore Pattern Cut Design. ~~SALAD ~ SERVING BOWL~~. We Are Always Ready To Assist. 10" At Widest X 4.5" Tall X 8.5" Wide Opening. FREE Trial! USE ZOOM FEATURE . 7 - Pc. Crystal Salad Set by Kensington- New In Box; 10" Salad Bowl + 6- 5 1/2"
7 PIECE CRAFTED CRYSTAL SALAD SET BY KENSINGTON, NEW IN BOX. YOU'LL RECEIVED 1- 10" SERVING/SALAD BOWL PLUS 6- 5 1/2" INDIVIDUAL NAPPIES. EACH PIECE FEATURES A RICK, DEEP MARQUIS CUTTING, EASY TO CARE FOR AND ALL PIECES ARE BOTH DISHWASHER AND MICROWAVE SAFE. Estate sale: Cut crystal 9" salad bowl. Great design cut and clarity. No makers marks. Over 5lbs. Light surface scratches on base as expected. The serving spoon and fork remain in their original wrapping. There is tarnish on the baseplate which would be easily removed. Lovely accent to any dish. This beautiful crystal bowl will be a.
Shannon Crystal Dublin Red salad bwl in excellent mint condition in original box with label attached. BOWL IS 9" EXCELLENT CONDITION. Hand Blown & Cut Leaded Crystal Serving Salad Centerpiece Bowl. From Alcobaca, Portugal. Bowl features a smooth interior. Great shine and transparency. Elongated leaf cut design on the exterior. Made from Full lead crystal. Beautiful Lead Crystal 8" Salad Serving Bowl. There is a small scratch or defect in the bowl as I have identified in picture 7. Check out the pictures for item condition. Beautiful cut crystal salad or fruit bowl. Box does show slight shelf wear, and was taped shut. Older Clear Cut Crystal 8 1/4" Fruit, Salad, Centerpiece Bowl - Whirling Star, Buzzsaw pattern-Sawtooth Edge. Lot of 3 Hoya Japan Crystal Fruit or Salad Bowls Iceberg Pattern 5 /12"
Lot of 3 lovely crystal salad or fruit bowls by Hoya of Japan. Iceberg Pattern. Contemporary design made to look like an iceberg or ice castle. Very heavy glass. 7 Hoya Crystal Glass Ice Berg Salad Fruit Berry Bowl Set Scandinavian Design! Best Regards, Paul & Miguel. Adams Towle Frosted Rose salad bowl in very good condition. No tarnish noted on base. Marked on inside of silver plated base with the Wm Adams trademark and W Germany. MAY ALSO BE USED AS A SMALL PUNCH BOWL OR CENTERPIECE. FREE Trial ! GLASS THICKNESS = 22 cm. INSIDE HEIGHT = 5". These gorgeous crystal bowls are carved of high quality Irish crystal. They will add spark to your table and luxury to anything they are used to serve. Their size is prefect for deserts, appetizers, salad and many other things. Large Sparkling Galway Irish Cut Crystal Salad Fruit Bowl -8”. No damage, no chips, no cracks, no scratches. Displayed in a China cabinet. Shipped with USPS Priority Mail. Measures approximately 10" in diameter, 4 3/4" deep, and is marked as shown. In very good condition with no chips or cracks, and just a few very light and minor scuffs on the bottom from gentle use. A nice large size bowl in this handsome Rogaska pattern that is now discontinued. Lovely! (1705) . Beautiful Crystal Salad/ Serving Bowl 8 1/2” Wide, 3 1/2” deep. No chips or cracks Condition is barely Used. I can usually ship Tuesday and Friday. Vtg Cut Crystal Silver Plate Rim Salad Serving Bowl - Leonard? - 9"
Still has the original VSL sticker attached. The bowl is in beautiful condition. They are only noticeable in very bright light and against certain dark backgrounds. This bowl has never been used. It is modern crystal; therefore, it is not lead crystal. The border of the bowl is dog ear patchwork pattern. Individual crystal dessert/salad bowl,plain,artist blown,polished pontil.4 3/4"
It is 2 1/2" high, ideal for shrimp salad, or desserts.I have several bowls in this pattern. HEAVY FOR ITS SIZE, ATTESTING FINE CRYSTAL. These photos might not represent the actual size of the item. This is a very nice 9" (w) x 3" (d) Lead Crystal bowl. The bowl has a wheat/star pattern with a saw tooth rim. It is in excellent condition, the bowl is very heavy. Would be great for serving a fruit salad or to display fruit on a wood dining room table. Waterford Crystalline Pineapple Bowl - Deep Salad Bowl 10 in. UP FOR SALE — Waterford Crystal Pineapple Bowl 10" Glassware. And frosted poppy flower design around the scalloped edge. Crystal Serving Bowl. Made out of a crystal glass material with a textured ribbed. This way I know you have received your item and are Satisfied.